Chef's Companion pork gravy dry mix delivers the "made from scratch" taste of comfort food with the convenience of speedy preparation. Use this mix and you'll be able to save on costs and labor when making large batches of gravy. It can be prepared either instantly or in an easy two-step stove top method. Both perform equally as well, bringing out a hearty, savory gravy taste in minutes! Each packet of gravy mix makes one gallon of gravy. Whether you're preparing traditional country-style favorites like Shepherd's pie or new culinary creations, this pork-flavored gravy is a perfect complement to main entrees and side dishes! You can even customize it and add your favorite ingredients. Its smooth, creamy consistency and savory taste naturally enhances your pork dishes, sausage, chicken fried steak, and pot pies. Pour this rich gravy over meats and serve with mashed potatoes and stuffing. Or, use it as a savory ingredient to create signature sauces for pasta noodles. Featuring a nice peppery taste that's not too salty, this pork gravy makes a versatile and convenient addition to any kitchen! 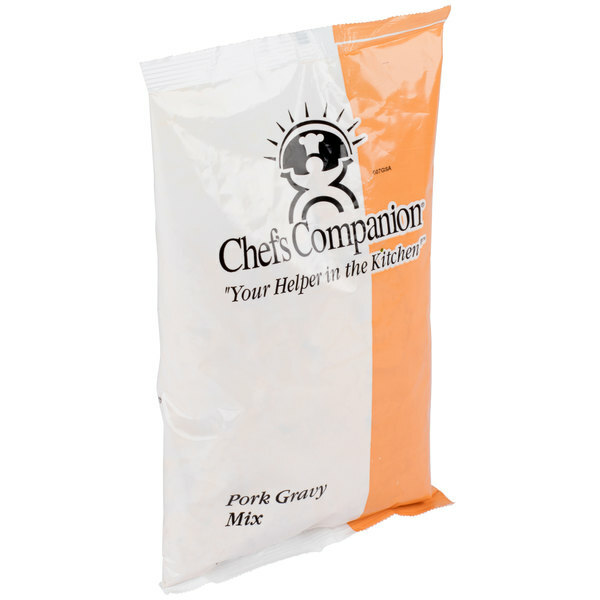 The pork gravy mix by Chef's Companion is a great buy and is super tasty. The mix is easy to prepare and the seasoning is perfect. great product for quick and easy gravy.its fat free but has a lot of salt.i try to use less salt with the meat and potatoes to offset that. Put in a 32 oz container like for spices. Filled container about 3/4 full. Hopefully tastes as good as it smells but don't know yet. great gravy, everyone loved it at the company , and the price was great as well. keep up the great work. I will be ordering from this company again. thank you all. I saw the reviews for this gravy and had to try it myself. This gravy mix is better than any can I have ever tried and actually tastes homemade! Add some drippings for even more flavor, but it really isn't needed and I guarantee you your guests will believe this is homemade. You can't beat the price! It is good for pork and other foods too. It's convenient to keep on hand. Gravies and sauces are very popular. This is a good one. Roasted pork loin is awesome, but we don't end up with enough juices to make gravy with. This gravy mix helps a lot. It's tasty and mixes very quickly. This gravy has a great flavor and thickens up nicely. Our cooks have reported that is much improvement over our old supplier. We have order this item twice now and will continue to do so. Pork gravy mix isn't a available in the local grocery stores, so when I saw this on the Webstaurant Store website, I thought I must try it. It's outstanding. It's easy to scale down the quantity directions for family use, it mixes easily with water (hot or cold) but absolutely best of all - it tastes wonderful. I make a couple of cups of this gravy and add it to the pan drippings when I make a pork roast. No longer do I have to HOPE I can make good gravy. Chef's Companion guarantees it. Pork Gravy is a must-have with pork chops and mashed potatoes, but pork chops give you no drippings for gravy. Chef's Companion Pork Gravy Mix to the rescue! This stuff mixes with either hot or cold water, and tastes like homemade. You can add a little bacon grease, if you want a more "authentic" tasting product. It mixes reliably at the rate of 1 cup of mix to 1 quart of water, so you don't have to make the entire gallon. That makes it a no-brainer!! This is something you have to keep in the pantry. On a every day bases you have to figure a way to bring the flavor out the pork you have made this can make those mashed potatoes taste good and I save time in the kitchen. But the flavor is what makes the meal and you can taste the pork in the mix. you can have High end pork chops to l pork roast but this has the flavor. A tasty easy way to make pork gravy. I use this when making a pork roast just add this to the drippings and it makes a yummy gravy. This prepared mix is great for whipping up gravy in seconds! Cuts down on labor costs! Nice full body flavor is sure to make you want more!! 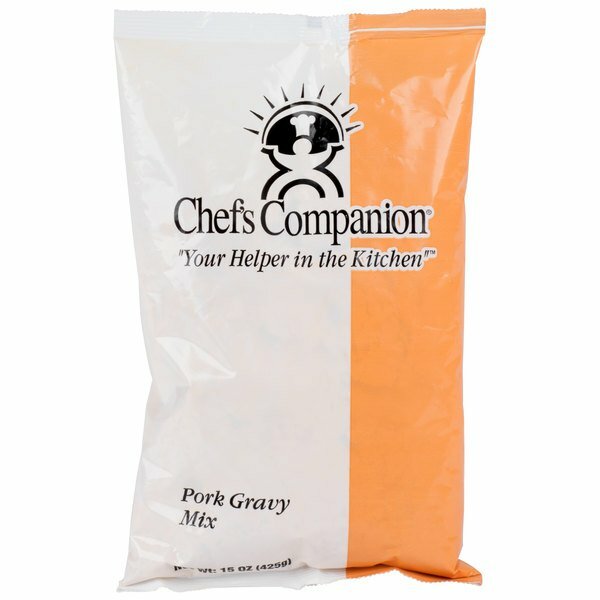 the chefs companion pork gravy mix is a super product. we offer it on several dishes here at our restaurant. its so good our customers often get a side to add to almost everything. Easy to use, and makes a very tasty gravy that compliments your pork dishes. I tried making it using the instant method according to package and it came out fantastic. No lumps either! I frequently use different gravies and decided to give the Chef's Companion Powdered Pork Gravy Mix a try. As with any other Chef's Companion mixes the preparation was quick and effortlessly and the whole bag yielded a whopping gallon of pork gravy, that is 128-ounces of tasty gravy; that is enough to serve 64 generous portions of pork gravy on top of the meal of your choice. Not only is this an excellent value for a pork gravy mix but it also tastes great. The Chef's Companion Powdered Pork Gravy Mix is an excellent choice for the commercial and home kitchens, and people always love gravy on top of the meat and potatoes, so you can't go wrong for such low price! Very easy to use for family reunions, catering, retail or home use. Great flavor, convenient, and easy to mix up. You can't beat the price either!